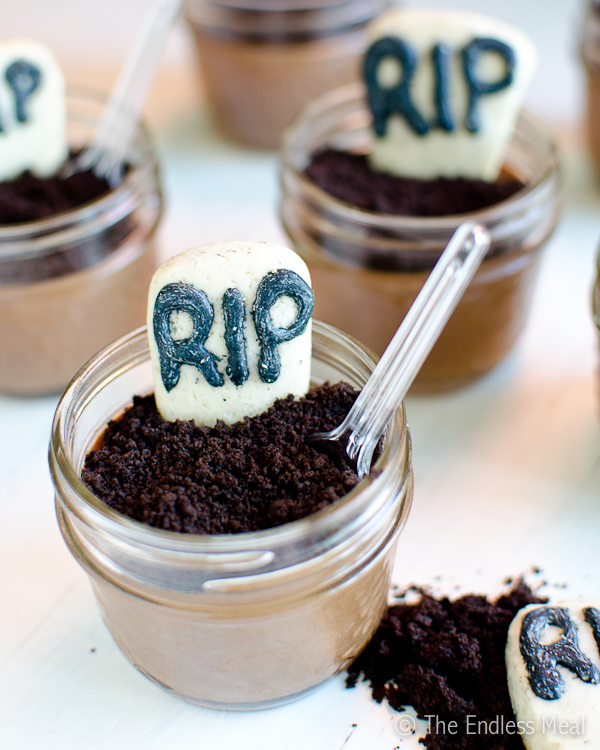 Just look how cute these little chocolate mousse graveyards are! It's kind of ridiculous how much I love Halloween and all the slightly cheesy, a little bit gory and downright fun the food can be. The inspiration for these totally adorable Halloween desserts came from a photo over at My Recipes. If you have a favourite chocolate mousse recipe definitely go ahead and use that. Or you can try out my take on Julia Child's Chocolate Mousse. Or you can use the recipe posted here; it's light and fluffy and chocolaty. Did I mention that I am a total sucker for Halloween desserts? This past weekend I was hired to cater a Halloween party and was encouraged to make the menu as fitting as possible. 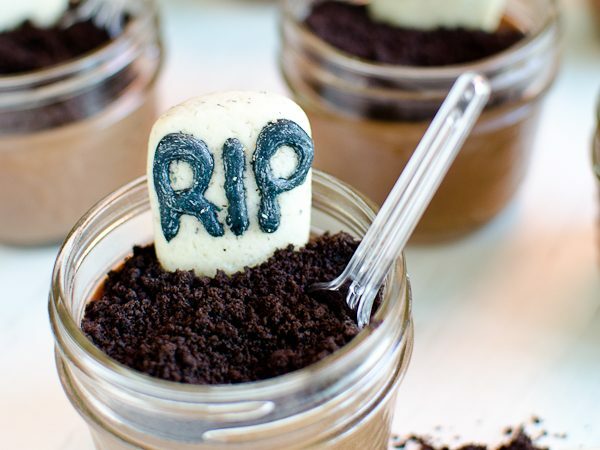 There were tomato eyeballs and severed finger cookies and a bubbling cauldron of cheese (otherwise known as Caramelized Shallot and Gruyere Fondue, at least when it's not served in a cauldron) and lots of other Halloween inspired treats, including these chocolate mousse graveyards. So guys, I need to quickly share something with you … I LOVE desserts served in 125ml mason jars. Seriously, they're the best! If you make these Halloween Chocolate Mousse desserts make sure to snap a pic and tag @theendlessmeal on Instagram so I can like and comment on your photos. I love seeing TEM recipes you create. If you're looking for a seriously cute Halloween dessert, this is it: Halloween Chocolate Mousse. The tiny graveyard scene is deliciously ghoulish. In a medium sized bowl melt the chocolate and butter over a pot of simmering water, making sure the bowl doesn't touch the water. When it has melted remove it from the heat and whisk in the egg yolks. In a large bowl add the cream of tarter to the egg whites. Beat with an electric mixer until foamy. Slowly add 2 tablespoons of sugar and continue beating until stiff glossy peaks form. In a large bowl add cream, vanilla extract and the remaining 2 tablespoons of sugar. Beat until stiff peaks form. Add 2 tablespoons of egg whites to the chocolate mixture and stir to loosen it. Carefully fold in the remaining egg whites. Then fold in the whipped cream. Divide mousse evenly between 8 small (125ml/ 1/2 cup) mason jars and place in the fridge to set for at least 2 hours. Make ahead: mousse can be made up to 2 days ahead and kept refrigerated. In a large bowl cream together the butter, sugar, eggs and vanilla using an electric mixer. In a medium bowl whisk together the flour, baking flour and salt. Slowly add the dry ingredients to the wet ingredients and mix till combined. Make a ball out of the dough, wrap in plastic and store in your fridge for at least 1 hour or overnight. Bake on cookie sheets for 6-8 minutes, or until lightly browned on the bottom. Remove from oven and cool completely. Using a gel decorating pen or icing sugar, write RIP on each tombstone. 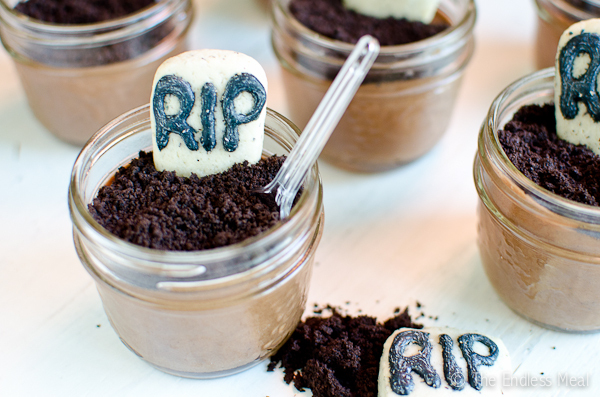 Scoop about 1 teaspoon of cookie crumbs on top of chocolate mousse and place a tombstone cookie in each. I substituted 1/2 cup of gluten free flour. The brand I use has black flecks (buckwheat four, I believe) and it worked well to produce a speckled, stone-like look. *Mousse recipe is from Joy of Baking. They have a great video tutorial which I recommend you watch if you are new to making chocolate mousse. cute and it looks yummy! These are freaking ADORABLE! A sort of grown-up “cute”, which I would have otherwise thought an oxy moron! Love. These are definitely fun, a fitting ending for Hallowe’en.